Amplis brand 90mm f/4.5 enlarging lens, for printing medium format negatives up to 6x7cm format. 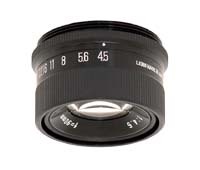 These lenses feature an f/4.5 maximum apetrure to provide a bright image for focusing and composing. Made in Japan. supplied with front and rear lens caps.